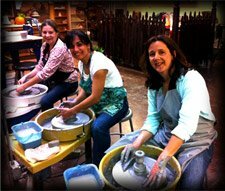 About the Studio - The Ceramics Studio! 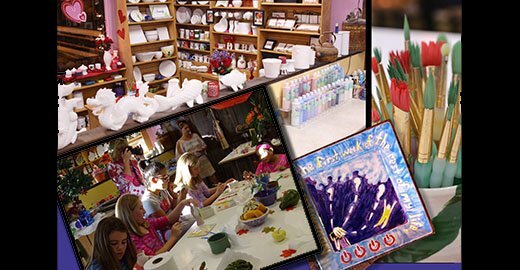 Drop-in to Paint Pottery, Hand-Build or Throw on the Wheel! Quote 1: 7/16/2015 A lovely place with really sweet staff. My husband took my 3-year-old a few weeks back on a father-daughter date and they had a great time making a ceramic mug. We went back a few days ago to paint the little one's masterpiece and I totally loved it there. The vibe is really peaceful and Natalie took great care of us. Quote 3: 1/19/2016 This is an awesome friendly creative space. 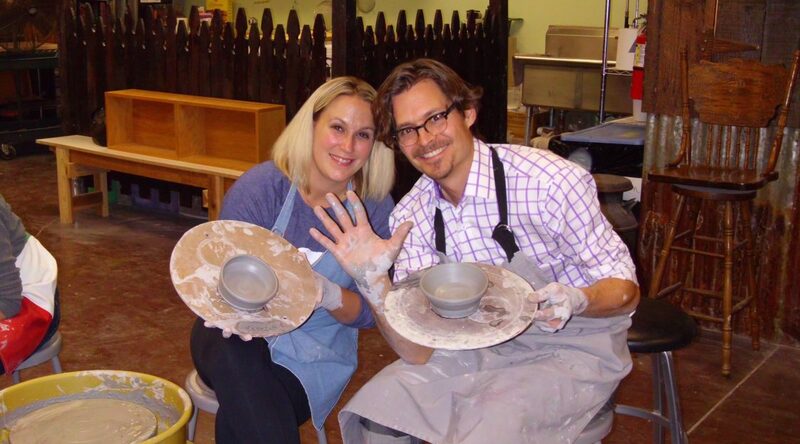 I have participated in their clay and cocktails, a Valentines Day date with my husband, even tried throwing on the wheel! Most recently we had my daughters 6th birthday party with them. Everyone was so helpful and kind. The party space is so nice, cutely decorated so it makes it so easy for the parents. The kids loved it! Quote 4: 7/16/2015 A lovely place with really sweet staff. My husband took my 3-year-old a few weeks back on a father-daughter date and they had a great time making a ceramic mug. We went back a few days ago to paint the little one's masterpiece and I totally loved it there. The vibe is really peaceful and Natalie took great care of us. I think the birthday party is a wonderful idea and I will totally look into that. 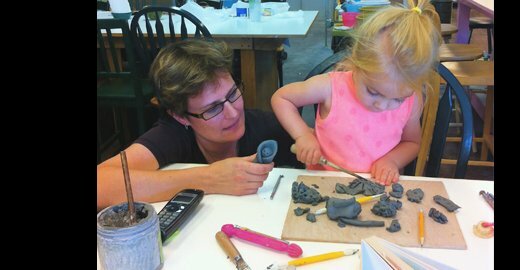 Quote 5: 7/15/2016 We had the pleasure of having a class with Melissa at the ceramics studio a couple of days ago. The funny part... We were three grown men looking to step out of our comfort zone and do something fun and creative! This isn't something one would immediately consider for an afternoon out bonding with their buddies, however, I can tell you that it was the most fun all of us could remember having in a long long time. The studio was beautiful, the experience is one we'll remember for the rest of our lives, it's inexpensive, and Melissa was a top notch professional who has the ability to cater to any crowd that might walk through her door. All I can say is thank you from the bottom of our hearts for making our trip a memorable one. I'll be sure to be back to refine my skills, and for you guys out there... Step out of your comfort zone. You'll be glad you did. Quote 6: 7/24/2016 Best place ever! We do the Thursday story time and my four year old loves it! Warning to parents, expect to help and get your hands dirty:) The toddlers have a short attention span, but when they get the finished piece back I have never seen toddlers more excited! Plan on two trips, one to hand form the piece and the other trip to paint it. The best part: they have a little cave like area for your kid to watch a movie when their attention span starts to veer off! We loved it so much that us adults decided to do the ceramics and cocktails night on Friday. We had the best time ever, we all brought snacks, and to our surprise she provided snacks as well. Our whole group got so excited when we picked up our pieces, we loved showing them off to one another. This place has a great staff that makes sure you have a great time! Highly recommended! Quote 7: A 9/15/2016 OMGosh! What FUN! 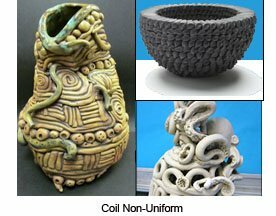 Looking for something different to do, my group found the Clay and Cocktails event at the Ceramics Studio. We're in Orange so we all jumped on the Amtrak (something new for us) to the Capo station and walked two blocks to the studio. We took along our own wine and snacks, got there early and used their party room for a picnic. Some of us threw clay for the first time ever, and others painted pieces. We had an absolute BLAST! I had no idea a pottery wheel could be so relaxing and addictive. Melissa was patient with her instructions and did a great job of making sure we came away with beautiful pieces. It was a fabulous 1/2 day adventure. Thank you. Quote 8: 5/26/2016 This is the best place to stimulate your creative side. 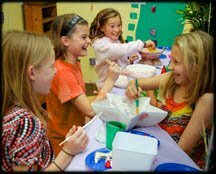 Whether you are coming to paint or play with clay, or have a party, the team at the studio will definitely put a smile on your face. 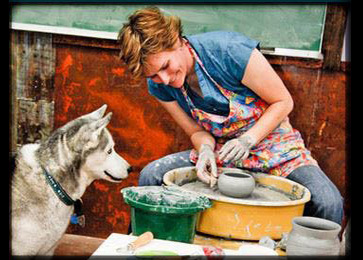 The adult classes are a wonderful way to learn more about pottery. Melissa is a wonderful teacher! Quote 9: 2/6/2015 I am glad to have come across this quaint ceramics studio in South OC! A word of advice though, since I had a nightmare finding this place... It's located in the Marshall's plaza! Anyway, a friend hosted her sister's birthday here for a party of 9. 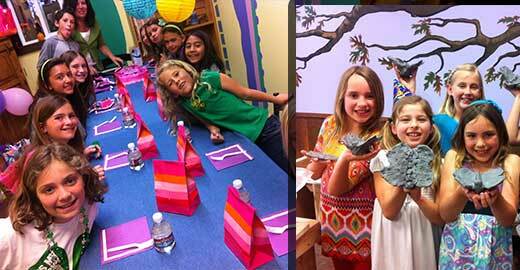 Each person got behind their own wheel to create the ceramic concoctions. Everyone was extremely nice, accommodating, and helpful, especially considering none of us knew what we were doing. I came about an hour and a half later than the rest of the party, but they made sure I made something I liked in the short amount of time left. While it was fun getting our hands dirty and trying something new, my favorite part was the group pictures we each left with. 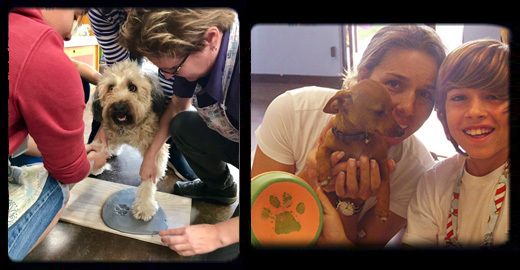 We will come back in late February/early March after our ceramics are baked to paint them! Quote 10: 10/28/2015 We recently had my daughters seventh birthday here. It was so much fun. The staff was amazing and super helpful. They have a party room that is already decorated, which was awesome because it was one less thing I needed to worry about. 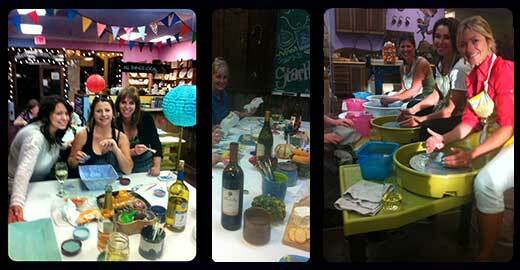 I would definitely recommend this place for a party or just to paint a piece of pottery.